Some nights you just need a quick sauce full of flavor to serve over your favorite pasta. When this is how I’m feeling, I choose spaghetti squash and then make a quick, yummy sauce to go with it. 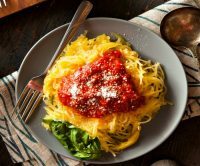 We love spaghetti squash, because it is full of nutrients like potassium, beta carotene, and vitamin A, yet only has about 60 calories in a cup and a half, which is a great serving for dinner. We like to serve it with broccoli tossed in lemon juice to play off the capers. First, you’ll need to steam the spaghetti squash using your preferred method. I cut mine in half and steam it in the oven at 400, using a Pyrex pan and water covered with foil. It generally takes 30-45 minutes. Then, I use a fork to pull the squash out of the shell. Heat 2 tbsp olive oil; add the leek and onion and sauté until just turning translucent. Add the pepper and mushroom and mix together. Push the vegetable mixture to the sides of the pan and add a little more olive oil. Add the protein and season with salt and pepper. Using a wooden spoon, work the protein to break it apart and brown while slowly mixing in the vegetables. This method will create a wonderful texture. When the meat is fully browned, add the garlic, capers, including the juice, and the tomatoes and stir. Once bubbling, simmer for 10-15 minutes. You may choose to add some pepper, but most likely the salt should be fine given the caper juice. Easy, yummy, nutritious, and full of flavor. What more could you want in a dinner? Remember, you can always add any additional veggies or fresh herbs you have in the house, if you like. And, if you like a thinner sauce, just add some tomato paste. How do you fix spaghetti squash?